June A. (Niewinski) Garcia, 59, of New Britain, Conn., died peacefully with her loving husband, Pedro Garcia and family by her side Thursday, Jan. 24, 2019, at Hartford Hospital. 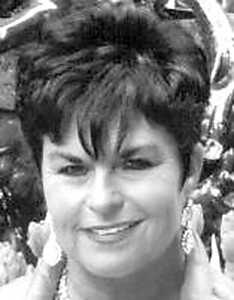 June was the daughter of the late John and Irene (Kalisz) Niewinski of New Britain, Conn. She was a graduate of Tunxis Community College and was employed by Central Connecticut State University for 32 years. June was a very faithful member of Sacred Heart Church. She loved traveling to and snorkeling in the Caribbean Islands with her husband. June was very active, enjoying walks with her husband, skiing in Vermont, and going out dancing. She was a dear friend to many and was always helping others when needed. June was a loving wife and sister, devoted to her home life, and spending quality time with her family. June is survived by her loving husband, Pedro Garcia of New Britain, Conn.; her two sisters, Arlene (Steven) Polzun of Newington, Conn., and Laura Niewinski of New Britain, Conn.; sister-in-law, Sonya (Jeffery) Anderson; her three brothers-in-law, Israel (Carmen) Garcia, Efrain (Dominga) Garcia, and Alejandro Garcia, and father-in-law, Pedro Garcia, Sr., and she also leaves behind several nieces, nephews, and cousins whom she loved dearly. We all will miss her very much as she was a big part of our lives. Funeral rites for June will be held Friday, Feb. 1, 2019, at 8:30 a.m. with the procession departing at 9 a.m. from Paul A. Shaker Funeral Home, 764 Farmington Ave., New Britain, Conn., followed by a Liturgy of Christian Burial at 10 a.m. at Sacred Heart Church, 158 Broad St., New Britain, Conn. Committal service and final resting place will be in Sacred Heart Cemetery, 662 Burritt St., New Britain, Conn. Relatives and friends may call at the Paul A. Shaker Funeral Home Thursday, from 4 to 7 p.m. Directions to Funeral Home - I-84 east or west - exit 37 (Fienemann Rd) right off exit - one mile down on right. To extend condolences to the Garcia family or to share a memory of June, please visit SHAKERFUNERAL HOME.COM. Posted in New Britain Herald, on Monday, 28 January 2019 18:50. Updated: Monday, 28 January 2019 18:52.